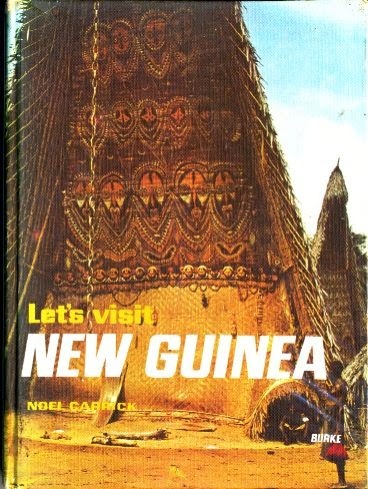 New Guineans were once among the most primitive peoples of the world. At that time their main occupation was fighting. They showed no mercy to their enemies who were more often than not merely men from the next valley rather than real strangers or foreigners. Customs which we today find quite shocking—cannibalism, head-hunting, murder, sorcery and witchcraft—were a part of their normal life. Until the Second World War, quite a few New Guineans lived in this way. Today, less than one hundred years since outsiders first ventured into the interior of this dragon-shaped island, New Guinea has become a peaceful and rapidly advancing home­land for most of its three million people. Although in some remote and lonely mountain valleys, warriors might still occa­sionally raid their neighbour's village for heads—and even eat their enemies' bodies most of them now live in peace. New Guinea is an island of 338,000 square miles. It lies in the southern Pacific Ocean, north of Australia and just south of the equator. Second to Greenland, it is the largest island on earth. (Australia, although surrounded by water, is a conti­nent, not an island.) Several smaller islands, with a total area of 23,000 square miles, lie to the north and north-east of the main island. New Guinea and the neighbouring islands form not one nation but two. The western part of the island of New Guinea is called West Irian and is part of the Republic of Indonesia. The eastern part and the off-shore islands are called Papua-New Guinea and are administered by Australia. The reason why the people who lived in this part of the world were so savage had much to do with the rugged nature of their land. It consists of mountains, jungles, swamps, rivers and flat plains, high in the mountains, called plateaux. Let us first look at this very rugged terrain, in order to help us understand why the people once acted as they did. Millions of years ago, New Guinea was joined to Australia but eruptions from under the earth's surface caused it to break away to make a separate island. Several million more years later, other disturbances beneath the earth rocked New Guinea, throwing up high mountains along its entire length. These eruptions occurred at a date which seems quite recent when we consider the great age of the earth and therefore the mountains remain high, steep and jagged. They have not had time to weather to rounder, smoother peaks as mountains in older countries like Australia. Between the mountains are narrow valleys; their sides are often as steep as cliffs. Then, on the valley floors, there are rivers. Some are as wide as the Mississippi, others are merely narrow streams. 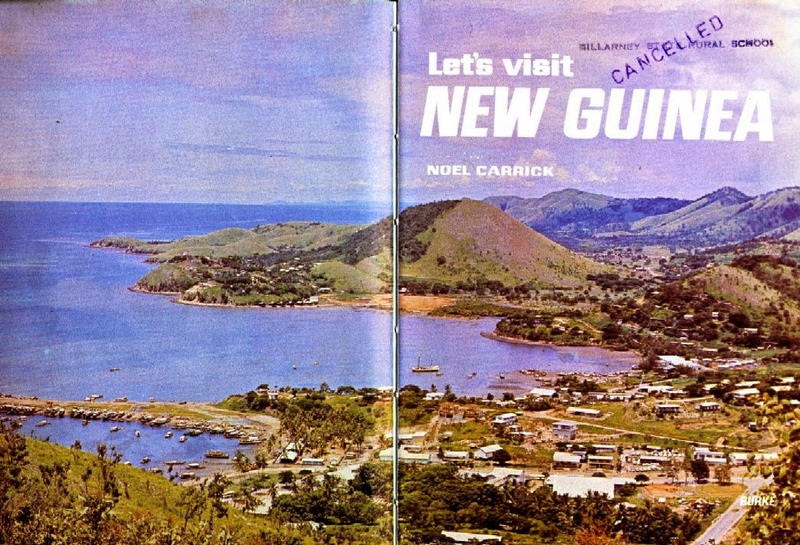 We think of New Guinea as a hot place - which indeed it is. But in the western part there are mountain peaks higher than 16,000 feet which, like the European Alps, are always capped with snow. Snow-capped mountains in the tropics close to the equator! This is just one of the many unusual things about New Guinea. There are some mountain ranges as high as 12,000 feet and many as high as 10,000 feet. In fact, except for a few regions, New Guinea is a land of mountains. The highest peak, Mt. Sukarno (16,448 feet), was climbed for the first time only in 1964. In some mountain ranges along the centre of the island there are plateaux, some of them up to 5,000 feet above sea level. In most places the mountains reach right down to the sea. Where they do not there are small areas of flat country. This flat country is often swampy and covered with jungle, mango trees and sago palms. The jungle is inhabited by mosquitoes, snakes, ticks, leeches, crocodiles and a host of other unpleasant creeping, crawling and biting things. The lower slopes of the mountains as well as the flat coastal areas are covered in jungles so thick that it is often impossible to walk through them. Trees grow, but when they reach a certain height they become covered by vines and creepers and other growth. There is no such thing as winter here. This sounds fine to those who live in cold climates but if there is no winter it does not mean that there is no rain. In the coastal regions it is humid and uncomfortable for most of the year. It never gets really hot in New Guinea as it does in the deserts of Arabia or Central Australia. Temperatures seldom go above 33 degrees Centigrade (90 degrees Fahrenheit). But most of the year, the humidity- that warm damp atmosphere that makes us feel sticky and uncomfortable is high. High up in the mountains, the temperature falls considerably; in the highest mountains, it becomes quite cold. On the plateaux, which are called the Highlands, the climate is mainly temperate and pleasant, like that of Europe during a fine summer. But all over New Guinea, rain falls frequently. Nowhere is the rainfall less than 100 inches a year. In some areas, it is as high as 780 inches a year. Imagine living in a country where it rains twenty times more than it does in England - yet remains hot at the same time.